Does a Monster Flood Have to Fuel a Monster Dead Zone Too? 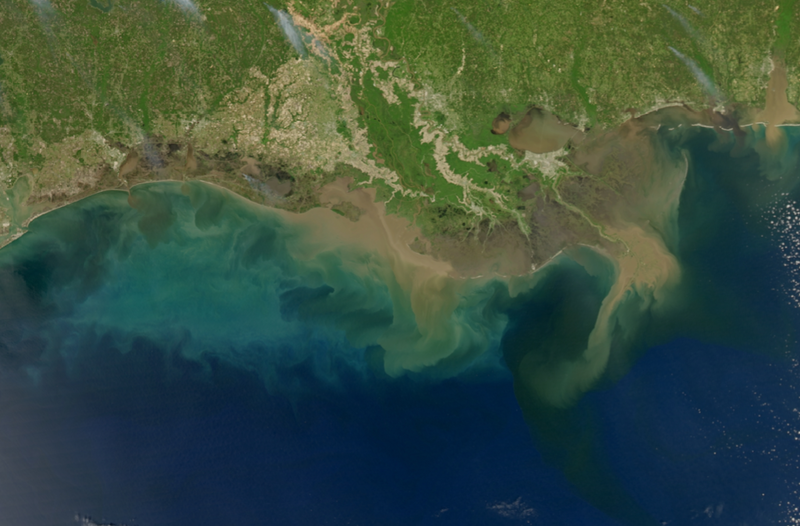 Sediment-laden water pours into the Gulf of Mexico from the Mississippi and Atchafalaya Rivers. Credit: Norman Kuring, Ocean Color Team. As you can see from the image above, a lot more than water comes down a river. 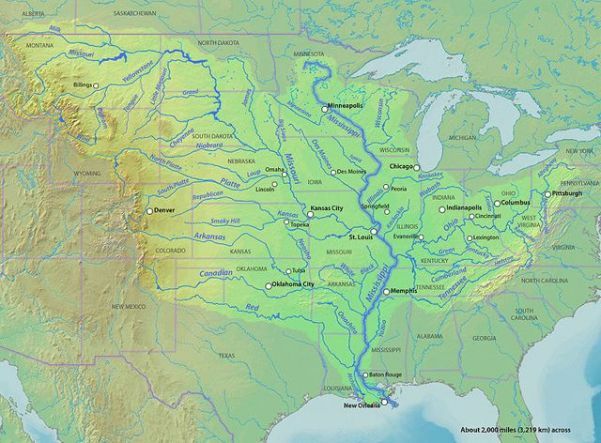 The Mississippi and its distributary, the Atchafalaya River, carry an average of 230 million tons of soil into the Gulf of Mexico every year. On flood years, the total runs a lot higher. That’s going to cause downstream problems this year… all the way downstream to the ocean. But before we go there, let’s take a quick look at how the system works. 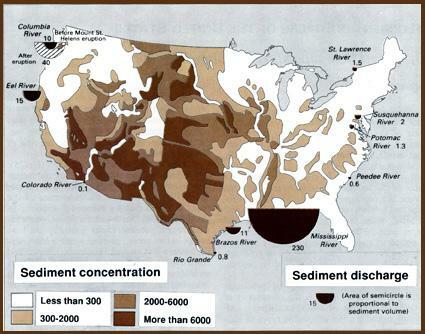 The graphic above shows sediment concentration and sediment discharge for major US rivers. The giant half-circle in the Gulf represents the Mississippi/Atchafalaya discharge. Why are the two rivers bundled together? Because they’re really the same river: the parentheses bracketing a 100-mile-wide delta. 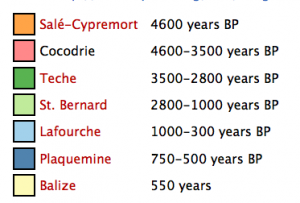 Mississippi delta switching during the past 4,600 years. Credit: Wikimedia Commons. Before 1927’s epic flood, the Mississippi was free to wander the delta, whiplashing between courses whenever a huge flood year like this one pushed it over its banks—a process known as delta switching. In the above image you can see some of its historical courses and when it ran them. There is a better way to the Gulf—150 miles shorter, and more than twice as steep. This path lies down the Atchafalaya River… Each year, the path down the Atchafalaya grows more inviting. 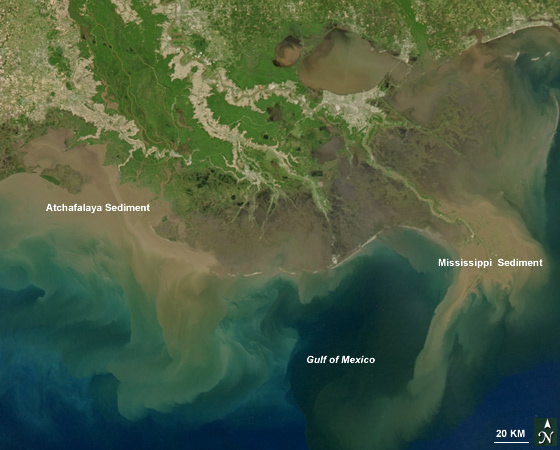 As the massive amounts of sediments the Mississippi carries—scoured from fully 41% of the U.S. land area—reach the Gulf of Mexico, the river’s path grows longer. This forces it to dump large amounts of sediment hundreds of miles upstream, in order to build its bed higher and maintain the flow rates needed to flush such huge amounts of sediment to the sea. Thus the difference in elevation between the bed of the Mississippi and the Atchafalaya—currently 17-19 feet at typical flow rates of the rivers—grows ever steeper, and the path to the Gulf down the Atchafalaya more inviting. Floods like this year’s great flood further increase the slope, as flood waters scour out the bed of the Atchafalaya. Mississippi River watershed. Credit: Shannon via Wikimedia Commons. Of course it makes no difference to the Gulf of Mexico whether the floodwaters come down the Mississippi or the Atchafalaya. What matters to the ocean is what’s in the river water. 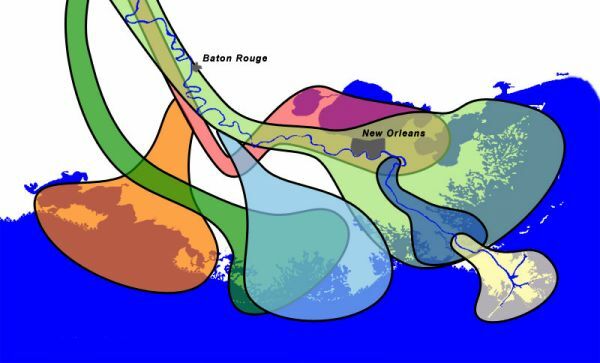 The Mississippi drains the entirety of America’s breadbasket… therefore its fertilizerbasket, pesticidebasket, fungicidebasket, and manurebasket. River water, with its organic nutrient loads, naturally acts as a fertilizer on ocean chemistry. Add in the runoff from farms and feedlots—with nitrogen and phosphorous loads from chemical fertilizers and manure—and you get a Miracle-Gro on steroids. Which, paradoxically, fuels an oceanic dead zone. Phytoplankton. Credit: NOAA MESA Project. I wrote extensively about this problem in my Mother Jones cover, The Fate of the Ocean, a few years back. 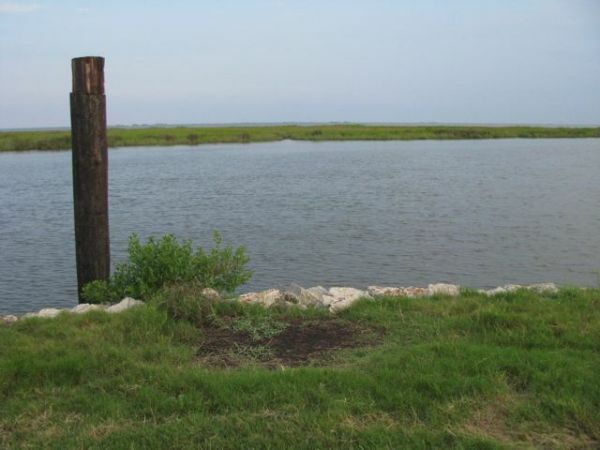 The Gulf of Mexico dead zone forms every summer when spring floods wash the nutrients downriver into the Gulf to fertilize massive oceanic plant blooms. The marine plants are mostly single-celled phytoplankton. The problem is the phytoplankton bloom so fast and furiously that their primary consumers, the zooplankton, can’t bloom fast enough to keep up and eat them all. 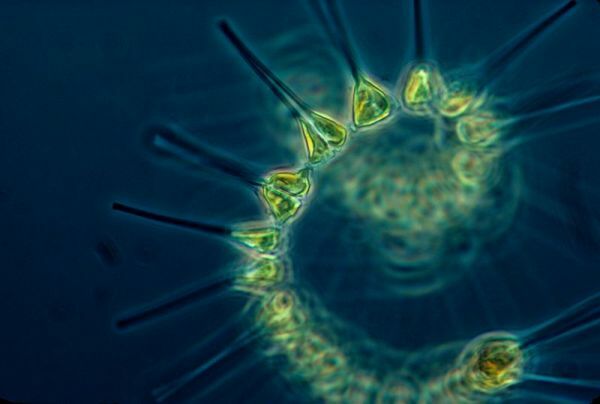 Many phytoplankton die uneaten and are then consumed by detritivores—the microorganisms like bacteria that feed on (that is, decompose) dead things. The Gulf’s spring and summer phytoplankton blooms also fuel detritivore blooms. 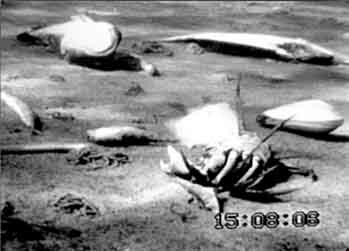 Video frame of dead zone of the Baltic Sea, showing the seafloor covered with dead or dying crabs, fish, and clams killed by low oxygen levels. Courtesy Wikimedia Commons. Unfortunately, growing populations of detritivores use up much of the dissolved oxygen in the water. Marine life that can’t swim away or otherwise flee these increasingly hypoxic zones, suffocate and die. You can see the results in the image above. 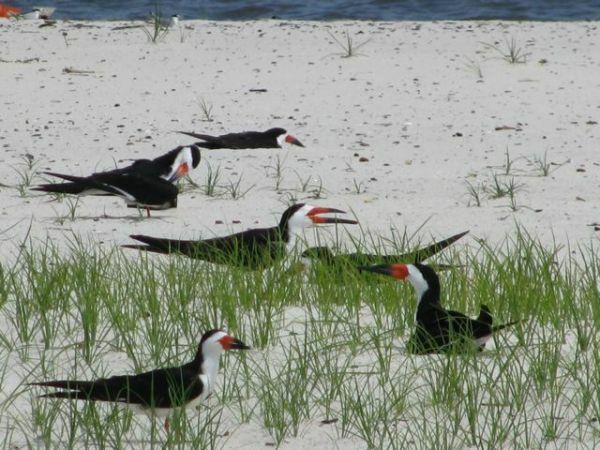 Black skimmers on the nest, Mississippi. Photo © Julia Whitty. Researchers are expecting a mighty dead zone will form from this year’s mighty floods. The Gulf, staggering back from last year’s oily assaults on its ecosystems, will likely pay a heavy price… again, smack in the middle of the most breeding season for everything from seabirds to tuna… and smack in the middle of important seasons for commercial fisheries, sports fisheries, and tourism. The solutions are relatively simple and highly effective. A similar course change has already been used to remediate the effects of overly nutrient-rich waters in the Great Lakes. The Atchafalaya River enters the Gulf of Mexico. Photo © Julia Whitty.